Woodlynde School believes the use of powerful, innovative technologies in classrooms led by well-trained and dedicated educators helps provide our students with the skills and strategies they require to be ready for college and ready for life. Woodlynde has a 1-to-1 laptop program for all its students. Every student in the school, from kindergarten to grade 12, is assigned a laptop for use in school; students in grades 6-12 can take their laptops home after school. All Woodlynde laptops have touchscreens, can convert to tablets, are pen enabled, and are replaced on a rotating basis so that no Woodlynde student laptop is more than four years old. Woodlynde utilizes a Microsoft environment. All Woodlynde laptops run the latest version of the Windows operating system. Additionally, each Woodlynde laptop features a wide range of software, either installed on the laptop or available through the web, to assist students with diverse learning styles and provide them with experience and training on productivity programs that they will encounter in college as well as in their lives. Please click on a software area below to discover what programs are installed on each laptop. Learning Ally is the world's largest library of audio textbooks and literature. Many of the textbooks Woodlynde students use are available through Learning Ally. By listening to the book while following along visually with the text, students improve reading comprehension, increase vocabulary, and improve fluency. Read Live is a web-based intervention and assessment program. It provides students with differentiated instruction that supports fluency, phonics, vocabulary, and comprehension. Students learn key vocabulary important to the stories they are reading and make predictions about what will happen next. Students learn proper pronunciation, expression, and phrasing by quietly reading aloud with a recording of the story. DESMOS is a web-based graphing and teaching program. At Woodlynde, students use this tool for plotting equations, classroom activities, connecting mathematical concepts to concrete, real-world shapes, and more. Our teachers find it beneficial as it can be used as an assessment tool that allows students to explore content without the traditional teacher-at-the-front-of-the-room format. Students can explore sorting through different pieces, teachers can embed video and pictures for students to work through, and as the full lesson is built, teachers can pause it for the whole class to go over a concept or pause it for an individual student to provide support in a certain area. Read and Write Gold offers support with reading text out loud, understanding words, researching assignments, and proofing written work. By listening to something they've just written, students are able to find the errors in it rather quickly. Dragon assists students with language-based learning differences by turning spoken words into printed words. Many students with language-based learning differences experience difficulty transferring their ideas to writing, and Dragon allows the writing process to become easier and more efficient. Students speak into a headset or microphone as the software turns their speech into words on their computer screen. WYNN is a literacy software tool aimed to enhance success for students with reading and writing challenges. The program highlights text as it is read, transforming printed text into understandable information and improving reading and writing fluency, encoding and decoding, and comprehension. Woodlynde’s student information system, onCampus, allows both parents and students to access classwork, homework, announcements, and student grades from any computer in the world. All Woodlynde students have access to almost unlimited cloud-based storage in both Google Drive and Microsoft OneDrive. Woodlynde has Smart interactive TVs or SMART Boards® in all its classrooms. Woodlynde is also one-hundred percent Wi-Fi enabled, providing students a high-speed network for their school laptops and a guest network for their personal devices. Woodlynde offers technology education as part of regular class instruction and as separate technology-oriented class offerings. Woodlynde uses assistive technology, productivity, and creativity software across all grade levels to assist and enrich class content. Middle school students take a mandatory technology elective to help prepare them for the increased use of technology they will experience as they progress through school. 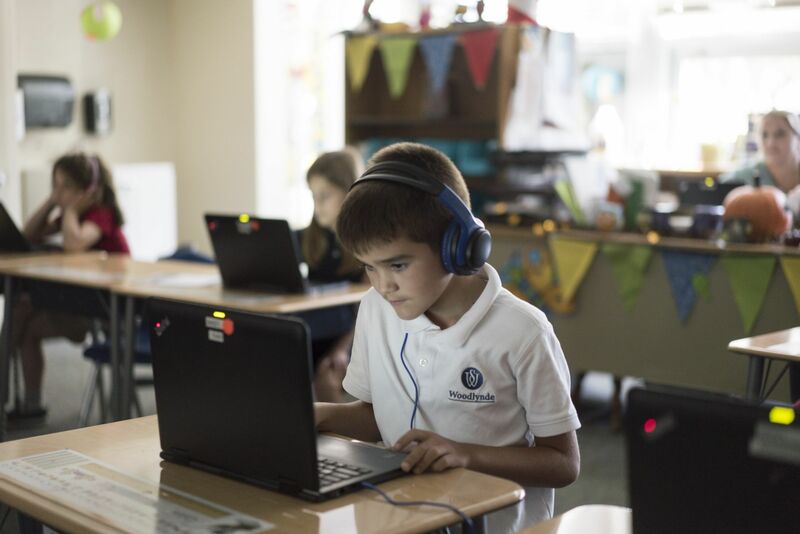 In Upper School, students who wish to have a more intensive technology experience can choose classes that teach programming, web design, game design, video editing, and robotics.